Retail • As shopping center celebrates first year, rivals and nearby businesses assess the giant shadow it casts. 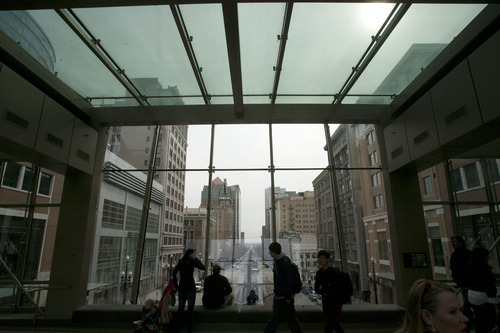 Steve Griffin | The Salt Lake Tribune Shoppers cross over the sky bridge at the City Creek Center in Salt Lake City, Utah Friday March 8, 2013. Steve Griffin | The Salt Lake Tribune City Creek Center in Salt Lake City, Utah Friday March 8, 2013. Steve Griffin | The Salt Lake Tribune City Creek Center in Salt Lake City, Utah Friday March 8, 2013. 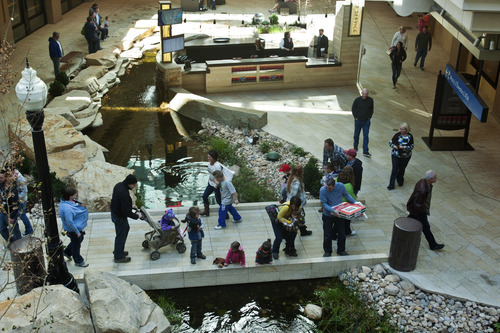 Chris Detrick | The Salt Lake Tribune City Creek Center is celebrating its one-year anniversary later through Saturday. Chris Detrick | The Salt Lake Tribune Shoppers walk around City Creek Center Saturday March 9, 2013. The Center will celebrate its one year anniversary later this month. Steve Griffin | The Salt Lake Tribune City Creek Center in Salt Lake City, Utah Friday March 8, 2013. Chris Detrick | The Salt Lake Tribune Shoppers eat in the food court at City Creek Center Saturday March 9, 2013. The Center will celebrate its one year anniversary later this month. Chris Detrick | The Salt Lake Tribune Shoppers walk around City Creek Center Saturday March 9, 2013. The Center will celebrate its one year anniversary later this month. Chris Detrick | The Salt Lake Tribune Shoppers walk around City Creek Center Saturday March 9, 2013. The Center will celebrate its one year anniversary later this month. Chris Detrick | The Salt Lake Tribune Shoppers walk around City Creek Center Saturday March 9, 2013. The Center will celebrate its one year anniversary later this month. Chris Detrick | The Salt Lake Tribune Shoppers walk around City Creek Center Saturday March 9, 2013. The Center will celebrate its one year anniversary later this month. Chris Detrick | The Salt Lake Tribune Shoppers walk around City Creek Center Saturday March 9, 2013. The Center will celebrate its one year anniversary later this month. Chris Detrick | The Salt Lake Tribune Shoppers walk around City Creek Center Saturday March 9, 2013. The Center will celebrate its one year anniversary later this month. Chris Detrick | The Salt Lake Tribune Shoppers walk around City Creek Center Saturday March 9, 2013. The Center will celebrate its one year anniversary later this month. Chris Detrick | The Salt Lake Tribune Shoppers walk around City Creek Center Saturday March 9, 2013. The Center will celebrate its one year anniversary later this month. City Creek Center was attracting national notice long before its glitzy grand opening a year ago this Friday. 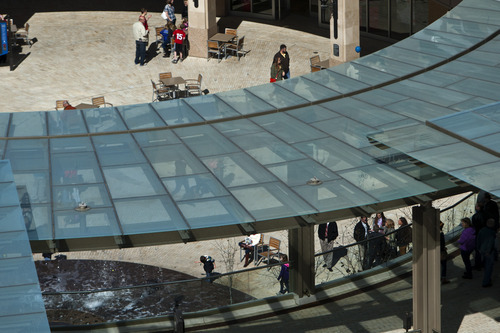 As the nation was struggling with the worst economic downturn since the Great Depression, City Creek was the first enclosed U.S. regional shopping center to open in six years  and the only shopping center of its size to debut in 2012. On Friday, the proverbial 800-pound gorilla of retail shopping celebrates its first anniversary with promotions, live music and sales. And although it might not have totally revolutionized the retail landscape along the Wasatch Front, it certainly has helped transform it, with more changes to come. One key rival, Fashion Place Mall in Murray, has kept pace and recently scored a big victory in attracting Utah&apos;s first Lego store. But it turns out City Creek couldn&apos;t have accommodated the iconic toy company because 98 percent of its space is filled. 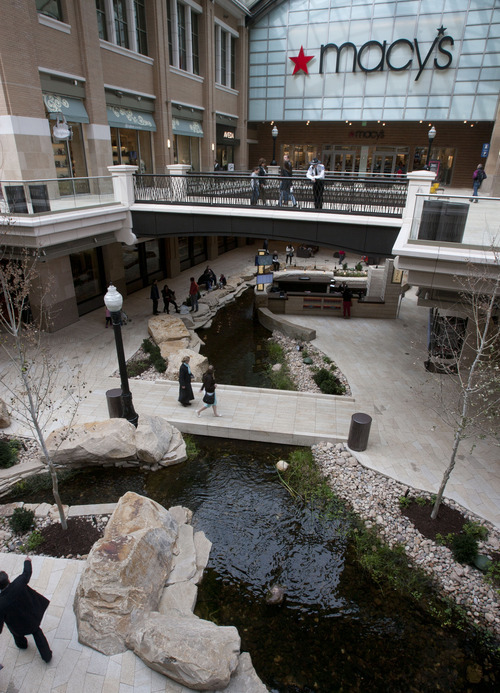 "We don&apos;t have a lot of space left," City Creek general manager Linda Wardell said. "For people coming into the market looking for a place to locate, there may not be many choices [here]." 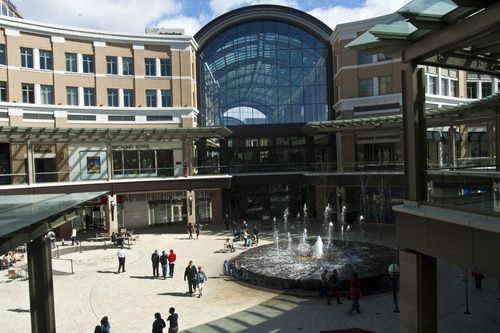 She wouldn&apos;t disclose sales numbers for the mall, but Wardell said City Creek has "exceeded our expectations" for both luxury stores and mid-range retailers dubbed familiar favorites. Bucking convention • The massive 20-acre development is nestled in one of Utah&apos;s largest-ever commercial real estate projects. A re-created stream runs through it. There are two 18-foot waterfalls, three fountains of dancing water and retractable roofs. Adjoining condominiums and apartments add an urban depth and breadth. Bucking an industry tradition, only two restaurants are open for business on Sundays and most of its eateries are alcohol-free. In many respects, City Creek is like few other shopping malls in the country. It is situated in a city ranked No. 4 nationally in the increase of people living within 2 miles of its city hall  behind only Chicago, New York City and Philadelphia, according to a U.S. Census Bureau report. "City Creek has not only helped the downtown market, it has put Salt Lake City in the forefront on the national scene," said J.R. Moore, a retail specialist at commercial brokerage CBRE. "We&apos;re seeing new tenants and developers taking a renewed interest in the Salt Lake market that we haven&apos;t seen for years." Opening two years after the depths of the historic economic downturn and after a record drop in retail sales for Utah&apos;s capital city, the mall hit town at an opportune time. According to data from the state Tax Commission, total taxable sales dropped to their lowest level in the past nine years in 2009, dipping below $2 billion. But they had started to bounce back with modest gains in 2010 and 2011 as City Creek&apos;s completion neared. The center&apos;s economic largesse since then, however, hasn&apos;t spilled over to other malls situated on the periphery of the massive project hugging the LDS Church&apos;s Temple Square. 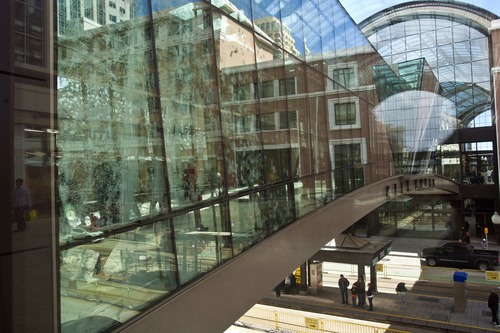 The Gateway, a few blocks west, lost 16 retail outlets to City Creek, including in late 2012 the Apple Store and its ever-present large crowds. Although officials associated with The Gateway said at the time the mall would endure, there&apos;s no denying that empty storefronts and smaller crowds have become more common. A $2 million renovation is said to be in the offing, but new-tenant announcements apparently are not. The effect on Trolley Square mall, about 2 miles to the southeast, has been less severe but still noticeable. City Creek lured one of its big tenants, home furnishing retailer Restoration Hardware. And in November, Trolley Square was placed into receivership after Bank of America filed a lawsuit claiming the mall owner owed it and other lenders $57 million. San Diego-based real estate services company Trigild has been appointed to operate the center, but its representatives declined to comment for this story. Some tenants say the opening last year of a gleaming Whole Foods store has been a godsend, but empty storefronts are visible at Trolley Square as well. 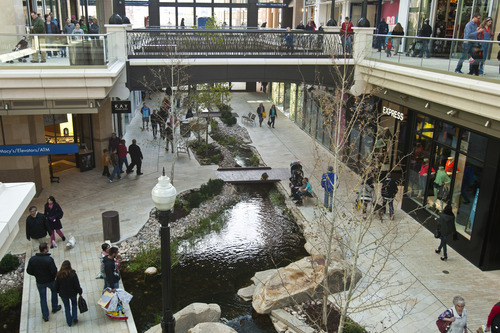 When it comes to City Creek&apos;s positive impacts, the results are still playing out. On Main Street downtown, some owners of nearby businesses say they have seen more foot traffic, but not necessarily more customers as a result. That could change in time, said Steve Bogden, of Coldwell Banker Commercial. "It usually takes three or four years for people to understand that they can finally go downtown," he said. "I still have people tell me that they haven&apos;t seen City Creek, and [that] it&apos;s supposed to be pretty cool. It is. "So much is happening downtown. Office buildings continue to fill and grow, and that fact alone means we&apos;ll see plenty of traffic. City Creek has some fun marketing programs, and they know how to do it. " Utah Woolen Mills, the clothing store at 59 W. Temple, endured five years of construction while City Creek was built. The store sits in an LDS Church-owned building that was spared demolition. Co-owner B.J. Stringham said he has seen more younger customers since the mall&apos;s opening, in addition to older ones who had passed the store for decades without stopping by  until now. Utah Woolen Mills has its own parking lot, just east of the shopping center&apos;s South Temple parking entrance. "People thought we sold yarn or something," said Stringham of the store that opened in 1905. "They were surprised at the high-quality clothing that we offer. Many had no idea." Breaking tradition • From the time of its opening and through its first year, City Creek has stood out for reasons good and, well, maybe not so good. Developed by Taubman Centers Inc. in partnership with The Church of Jesus Christ of Latter-day Saints, it is anchored by Macy&apos;s and Nordstrom, with more than 100 stores and restaurants. The center has some tenants other malls don&apos;t, such as jeweler Tiffany & Co. Since its debut, 14 more stores have been added, including Apple, which broke a 10-year lease with The Gateway. Microsoft Corp. plans to open its first retail store in Utah on April 11, following its strategy of placing outlets in the same malls where Apple already operates. Brio Tuscan Grille (which also is at Fashion Place) is under construction, as is Alex and Ani, a marketer of eco-friendly jewelry. Johnny Rockets restaurant (which also has other locations in the valley) will open in June. Initial concerns about limited alcohol service dampening the center&apos;s appeal seem to have faded. Liquor is available at only two restaurants, The Cheesecake Factory and Texas de Brazil Churrascaria. Nord­­strom even agreed not to sell alcohol in its cafe. That&apos;s a nod to the LDS Church, the dominant religion in Utah, which teaches its members to abstain from alcohol. 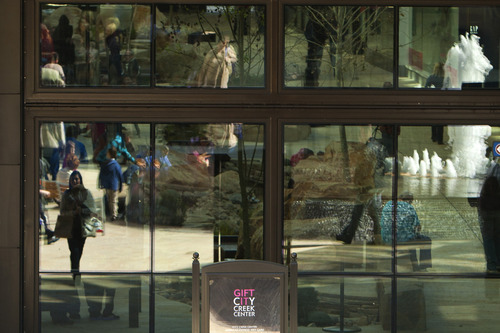 City Creek also is the only mall among two dozen operated by Taubman that isn&apos;t open on Sundays, in yet another concession to the church. Only The Cheesecake Factory is open that day. LDS Church President Thomas S. Monson and other church leaders were present for the mall&apos;s opening. But a church spokesman this week referred comment on the center&apos;s first year back to Taubman. Nordstrom spokesman Collin Johnson said the company "is fortunate to be a part of the City Creek Center, and we&apos;re encouraged by response from our customers." The retailer had closed a store downtown in January 2007 after 27 years when the old Crossroads Plaza and ZCMI Center malls were demolished to make way for City Creek. Johnson said Nord­­strom was gratified at how many of its former customers returned. Benefits where you find them • As for City Creek&apos;s direct financial impact, that&apos;s harder to quantify. Salt Lake City officials cannot specify how much the city has benefited, but sales tax revenue for the municipality had increased nearly 11 percent year-over-year by the end of the third quarter, according to the most recent figures available from the Utah Tax Commission. Although some neighboring businesses aren&apos;t seeing much benefit from City Creek&apos;s presence, others are as more people visit downtown. 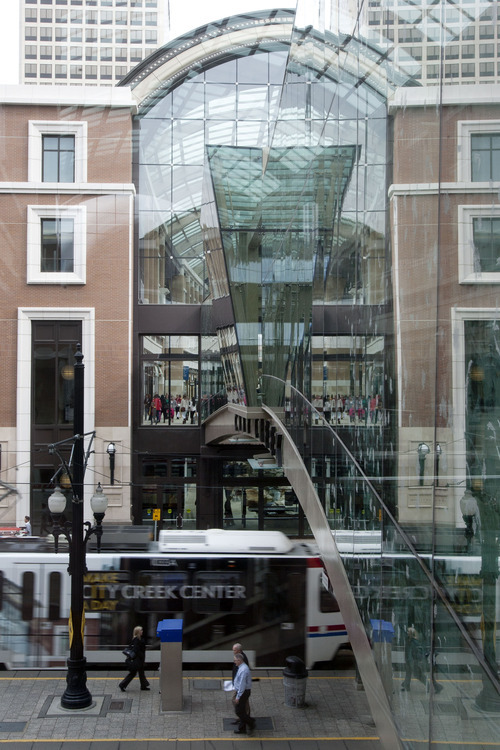 A survey for the Downtown Alliance last fall said of more than 400 responses from Utahns statewide, 67 percent said they had visited City Creek. Of those, 45 percent said they also shopped or dined at a store not connected to the mall. The survey, conducted by Richter 7 and Lighthouse Research, had a margin of error of plus or minus 4 percentage points. "Businesses that do their own marketing are benefiting from City Creek, and those that don&apos;t aren&apos;t," alliance executive director Jason Mathis said. "The mall is bringing people downtown, but businesses must be proactive to get people through their doors." Main Street barber shop owner Ray Francom said he doesn&apos;t see much overflow from City Creek. Most of his customers come from surrounding hotels and office buildings. His business has increased sixfold in the past few months. His shop opened in February 2012. "City Creek could have something to do with it," he acknowledged. One immediate benefit to downtown spurred by the mall was the opening of Harmons City Creek market, on the eastern edge of the project. It is the first large urban grocery to open in the business district in a half century. Co-owner Bob Harmon said executives knew the store would have a big lunch crowd; they were not disappointed. The store serves 1,000 lunches each weekday, with 1,000 also being the number of seats in City Creek&apos;s food court. Sales receipts are up about 7 percent in the first year. Now the market at 135 E. 100 South is concentrating on attracting downtown neighbors long accustomed to driving elsewhere to shop. That&apos;s been a much more difficult endeavor "because we&apos;re talking about changing people&apos;s habits," Harmon said. 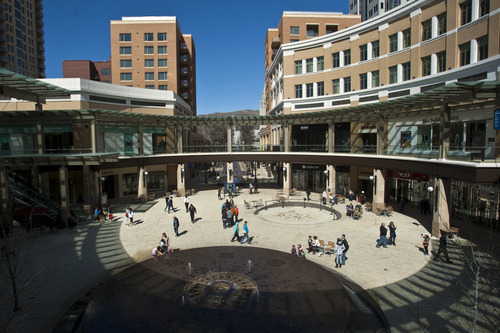 Research has shown that within the City Creek store "footprint"  including downtown, the Avenues and surrounding neighborhoods  there are 30,000 households. Encore, anyone? 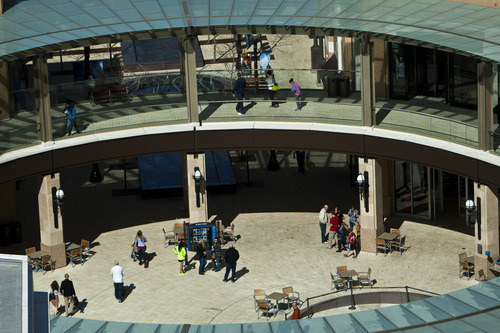 • The mall is among 27 regional and outlet shopping centers in the U.S. and Asia owned or operated by Taubman. 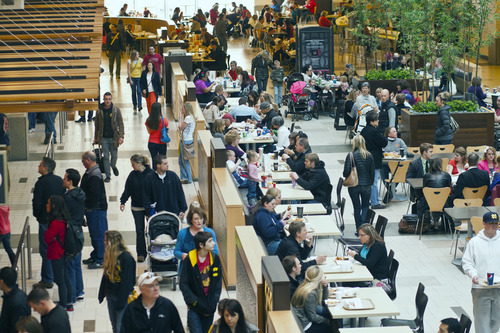 The latter&apos;s U.S.-owned properties are considered the most productive in the publicly held U.S. regional-mall industry. The company does not release sales figures for individual malls. But officials said City Creek had 16.2 million annual visits, including 1.6 visits per month by a typical resident of the valley. Ogden&apos;s Brent Lund brings his four granddaughters to City Creek once or twice a month to enjoy the fountains and maybe a chocolate treat. "There&apos;s lots to do and see," he said. "It&apos;s a great place to visit." As for the rest of this year and the years ahead, what does City Creek, at 98 percent of capacity, do for an encore? Managers say shoppers can expect more live entertainment and more marketing designed to attract additional shoppers and visitors to downtown. Brewer points out that at least one-third of the shopping center&apos;s stores can&apos;t be found anywhere else in the state. "Since its opening," he said, "retailers clearly recognize this is a successful environment to do business." Join us at 12:30 today to discuss this story with news makers and Tribune reporters and editors. Harmons City Creek • First downtown market in half a century; serves 1,000 lunches weekdays and sales are up 7 percent since its opening. The Gateway • Lost 16 stores to neighboring City Creek but has Megaplex movie theaters, Discovery Gateway Children&apos;s Museum, Clark Planetarium and the Urban Art Gallery, and has started a $2 million renovation. Trolley Square • Lost Restoration Hardware to City Creek but has Whole Foods Market, Weller Book Works and long-term leases with Pottery Barn, Pottery Barn Kids and Williams-Sonoma. 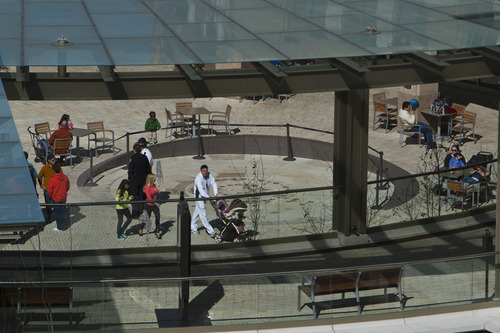 Fashion Place Mall • A spokeswoman said sheer distance means there&apos;s little competition with City Creek. 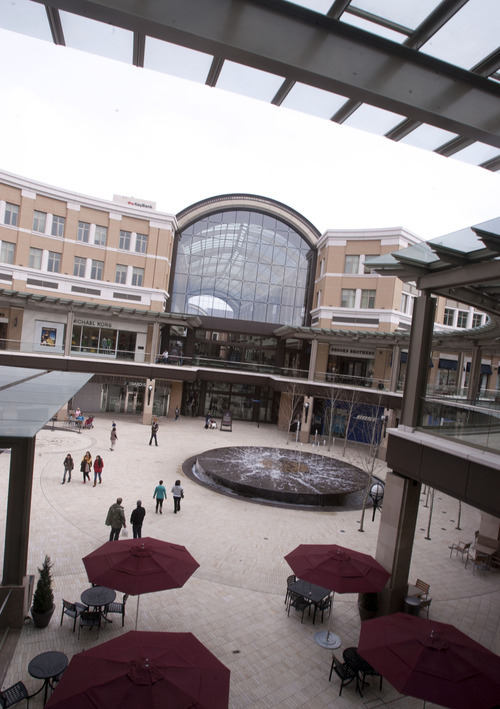 The Murray mall has several of the same stores, such as Nordstrom, Macy&apos;s, Apple, H&M and Crate & Barrel. It scored a recent coup by landing Utah&apos;s first Lego store. 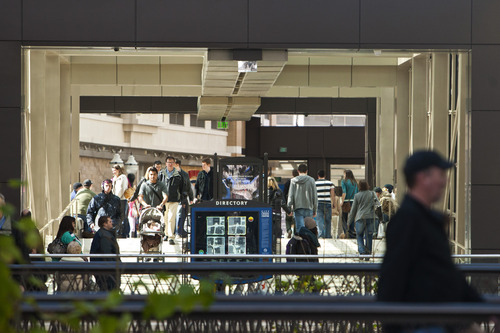 Because of City Creek Center&apos;s proximity to the LDS Church&apos;s Temple Square and because of the church&apos;s business partnership with mall operator Taubman Centers Inc., some civil liberties advocates worried a year ago that rules of conduct would be unusually strict and lead to confrontations. Taubman officials have been quick to point out that any restrictions are identical to ones at any of Taubman&apos;s other two-dozen centers nationally. And although City Creek marketing director Dee Brewer said he&apos;s been surprised by the number of times people have asked whether shoppers would be told to leave for violating rules, he noted ejections have been rare and conflicts few. The most frequent question, he said, is whether shoppers are allowed to sport tattoos. The answer? Yes, they are.